Hydroforming Press structures are combination with integrated water and control system for high pressure fluid, that fit to ductile metals such as aluminum, brass, low alloy steels, stainless steel. The most applications of hydroforming are the automotive industry and bicycle pipe, which makes use of the complex shapes stronger, lighter, and more rigid antibody structures. Now, Lien Chieh Machinery (LCM) is thriving and endeavors to improve the quality of our products. We pursue product innovation and excellence to meet the diverse need of customers; at present, we have two different models for different purpose of hydroforming press, that function and load weight both different. Especially, we have one hydrofoming press which specialized in producing bicycle parts that can load 1100 ton weight. It can reduce your cost and improves your efficiency and output, above all gains excellent feedback from our customers. 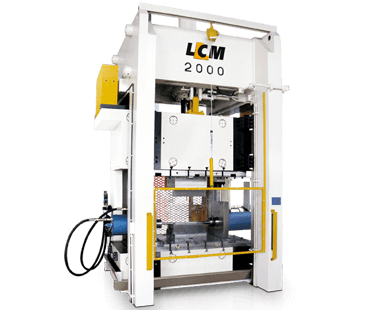 We offer a range of hydraulic presses which can be customized to match the exact requirements of the end product or part that are including: Press Drawing Presses, Cold Press, Hot Press, Hot Forging Press, Forming Press, Metal Forming Press, High Speed Press, and Mechanical Press. We update users with the latest and the best technology and service. Furthermore, we also provide new value and Hydroforming Press with unlimited potential for our customers. If you are searching the best one, please contact us.